Georgetown University is dedicated to making education more accessible for our nation’s service members, veterans, spouses, and dependents. Military-connected students enrolled in certificate, bachelor’s degree, or graduate degree programs at Georgetown University’s School of Continuing Studies may be eligible to use military education benefits through the Department of Defense or Department of Veterans Affairs to help finance their studies. After military-connected students have been admitted to and confirmed enrollment at Georgetown University, they must be approved to use their military education benefits. To do this, students must complete an original application if they are using U.S. Department of Veterans Affairs education benefits for the first time. If students have previously used these benefits for a different degree or at another school, they must complete the Change of Program or Place of Training, VA Form 22-1995. Students eligible for Department of Defense education benefits must also be approved by their command or through their online education portals. Visit the Georgetown University Veterans Office website for information on the certification process and resources available to military-connected students. Prior to registration, complete the VA Benefits Request Application Form and upload a copy of your Certificate of Eligibility using the process outlined on our Resources for Military Students page. For more information on other military education benefits, please visit the U.S. Department of Veterans Affairs, or download our brochure. Georgetown University is a proud participant in the Yellow Ribbon Program, enhancing financial access for eligible military-connected students who are 100% eligible for Post-9/11 benefits and not on active duty or receiving transferred benefits from a spouse on active duty. The Yellow Ribbon Program is structured to take effect once an eligible participant has met the Post-9/11 private tuition maximum for an academic year. After the Post-9/11 tuition benefits have been met within an academic year, the Yellow Ribbon Program will cover the remaining required tuition and fees costs. Certain fees are not covered. Eligible noncredit programs and the Doctor of Liberal Studies degree are covered by the GI Bill, but not by the Yellow Ribbon Program. 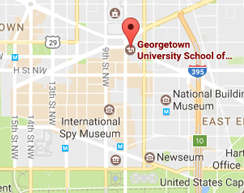 There are also a number of scholarships available to military-connected students at Georgetown and nationally. For more information about financial options, please contact the SCS Financial Services Office.